Marches and peaceful demonstrations were held in different parts of the country, and the capital, during the days of action. This bloc of organisations is demanding that Lugo comply with his electoral commitments, especially in regards to agrarian reform. It is also demanding that he attack with particular harshness the right-wing bloc that has a majority in both houses of Congress and which puts a break on social projects and seeks to legitimise repression against popular demands through new laws. The response to these mobilisations by the mass media is scandalous. It distorts and attacks the leaders of the EUP, linking them to all types of crimes (closeness to kidnappers, to drug traffickers etc.). Nevertheless, this aggressive attitude demonstrates the weakness of a backward dominant class that, after losing the political hegemony it held via the Colorado Party (Partido Colorado), which was in power for 60 years uninterrupted, does not have a political party it can use to truly represent its interests and maintain the structures that allowed it to accumulate wealth. It is clear that the coup in Honduras has unleashed the possibility of deepening its virulent and daily attacks against the Lugo government, which sustains itself in an equilibrium among turbulent waters. Lugo’s electoral victory was facilitated by the decomposition and crisis of the relations between party and dominant classes, as well as the (extremely) broad alliance he was able to achieve. But Lugo “reached government, not power”, and now has to confront a range of organisations that – although with contradictions – see the reactionary right as their principal enemy while at the same time demanding that Lugo carry out of his program to change social policy and transform judicial power, and that Congress approve laws that favour the people. They are also demanding that a stop be put to the poisoning of the population through the indiscriminate use of toxic agricultural chemicals. Lugo, the ex-bishop, has until now had a populist discourse, but he has still not carried out the reforms that the country needs to come out of backwardness and advance towards development and sovereignty. The United Popular Space is a recent experience that aims to construct unity of strategic purpose in the face of the current balance of forces, with the objective of constructing a popular bloc through mobilisation and organisation, as weapons of struggle. But this task is not easy and a first step was the August 10-15 days of action, regardless of the results, were part of a process of necessary accumulation [of political forces], with the limitations and divergences that exist. In Paraguay, the great battles in the democratic camp are only beginning and the key force is the people. The P-MÁS (Party of the Movement Towards Socialism) and the Tekojoja party form part of the government. The PCPS and the Paraguayan Communist Party are not part of the government, but called for a vote for Lugo in a joint signed document. April 20 marked 12 months since the historic victory of former Catholic bishop Fernando Lugo in Paraguay’s presidential election. Almost a year into his government, the Paraguayan political situation is providing many difficulties and obstacles to the carrying out of the changes promised during the election campaign. We will try to analyse the complex political process that Paraguay is passing through, along with its background, challenges and perspectives. Since the end of the 19th century, following the disastrous war against the Triple Alliance (1865-1870), a very peculiar two-party system emerged in Paraguay. Created with a strong influence from the invading powers (Brazil and Argentina), both the Republican National Association (Asociación Nacional Republicana, ANR), later know as the Colorado Party, and the Democratic Centre (Centro Democrático), later the Authentic Radical Liberal Party (Partido Liberal Radical Auténtico, PLRA), emerged in 1887, inaugurating a bipartisan logic that, despite changes and transitions, retains its principal characteristics. In general terms, both parties have maintained the same composition and structure since their founding. The ANR and PLRA are traditional mass parties with an oligarchic character and with deep roots in different strata of the population. This two-party system was characterised by long periods of political hegemony of one party or the other. There have been two periods of ANR hegemony – the first from 1887 to 1904, and the second from 1947 to 2008 – as well as a period of PLRA hegemony from 1904 to 1940. The last period of ANR hegemony (from 1947 to 2008) included 35 years of military dictatorship under General Alfredo Stoessner. This military dictatorship (1954-1989) was one of the longest in Latin America, consolidating a perverse structure that unified three pillars of power under the same command: the state, the armed forces and the ANR. This dictatorship not only allowed the ANR to consolidate power in a political situation marked by strong convulsions, it also consolidated the basis for this party to remain in power for decades. It managed to force a consensus upon different power groups in the country and managed to demobilise, to a large extent, a thriving popular movement. Workers’ organisations, as well as peasant and student organisations, were the target of attacks by the dictatorship during its first decade. The left also suffered heavy blows. Under the maxim “democracy without communism”, the regime launched an onslaught against all political organisations of a progressive character, managing to decimate three generations of militants and socialist activists. On the night of February 2, 1989, General Andrés Rodríguez, one of the most important members of the regime and an in-law of the dictator, led a military coup that ended the Stroessner regime. Months afterwards, national elections were held, the first free elections in decades, which gave victory to Rodríguez. The so-called transition to democracy was inaugurated. While allowing public liberties and the opening up political participation to previously relegated sectors, it guaranteed power to the same sectors. The first municipal elections took place in 1991, in which a candidate independent of the traditional parties and with a progressive orientation was elected mayor of Asuncion. In 1992, a National Constituent Assembly was installed to give birth to a new constitution, that today still remains in force. Rodríguez ended his term in 1993 and following the elections that year handed over command to the first civilian president in decades: Juan Carlos Wasmosy, also from the ANR. During his government, internal divisionswithin the ANR were greatly accentuated, as the confrontation with his old adversary, the caudillo Luis María Argaña, grew and a new current emerged led by General Lino Oviedo. The governing party became divided into at least three currents, all of them in open confrontation. With the 1998 presidential election, the confrontation reached a high point. The election was won by a temporary alliance of two factions (the Oviedistas and Argañistas), but having barely assumed the presidency, the confrontation once again opened up, reaching critical points including the assassination of Luís María Argaña, vice-president of the Republic and leader of one of the factions. This event not only increased struggles within the ANR, but even provoked an important split led by General Oviedo, who went on to create a new party. 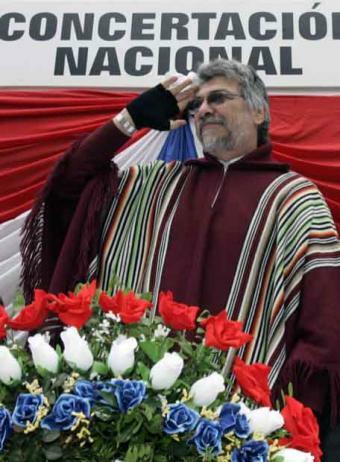 Nicanor Duarte Frutos, the last president from the Colorado Party, took office in 2003 with the challenge of reconciling the strong internal divisions within the ANR, at the same time as not affecting the interests of the country’s economically powerful. During his government, assisted by a period of economic prosperity, he managed to lift social and macroeconomic indicators. Sectors of the economically powerful continued to clash, while the majority of the people didn’t receive significant benefits (health, education, housing, food assistance, etc. ), which if they had might have won greater support for the government. The fierce political confrontation (both inside and outside the ANR) added to the decline of a government that was finishing its term, generated the necessary conditions for the emergence of Bishop Fernando Lugo as a figure who could unite above all the differences. In a situation of a highly discredited government, Lugo -- known as “the bishop of the poor” for his role in the San Pedro diocese (one of the poorest departments in the country and with a high level of social unrest) -- appeared as a reference point of a large protest mobilisation against the judicial and executive powers. That is how a wide spectrum of social and political forces started to gather around him with the aim of achieving much-yearned-for change. With the slogans of the forgotten sectors like the peasantry, housewives, informal sector workers and the poor in general, Lugo also took up the demands of those middle and more wealthy layers that rejected the bad management of the state. In this way he managed to set himself up as the great unifier of the population, all of whom were sick of the injustices that had reigned for so many decades. The different left organisations and right-wing political parties tried to exclusively promote the candidacy of the ex-bishop, so as to stamp on him a determined political-ideological orientation from the start. In the end, there were two large forces that ended up supporting Lugo’s presidential candidacy: the Popular and Social Bloc (Bloque Social y Popular, BSP), which brought together the social movements and left-wing organisations, and the National Coalition (Concertación Nacional, CN), which brought together the right-wing parties in the opposition. Out of the union of both sectors emerged the Patriotic Alliance for Change (APC), the political-electoral platform of Lugo. The founding document of the APC, which established the principal programmatic lines of the alliance, defined as fundamental tasks: economic recovery, agrarian reform, renewal of the country’s institutions and combating corruption, the installation of an independent judiciary system and the recovery of national sovereignty. Of the principal right-wing parties, only the PLRA genuinely participated in the APC. The National Union of Ethical Citizens (Unión Nacional de Ciudadanos Éticos, UNACE) of General Oviedo, and the Beloved Homeland Party (Partido Patria Querida, PPQ), from the Catholic right, withdrew their initial support offered to the ex-bishop in order to launch their own candidates. But they couldn’t avoid an important flight of votes to the candidate of the APC. Almost the entire left participated in the APC, with varied ideological viewpoints. United action was achieved based on consensus of the need to deepen democracy. The progressive and left-wing groups that formed part of the APC were: the Febrerist Revolutionary Party (Partido Revolucionario Febrerista), the Progressive Democratic Party (Partido Democrático Progresista), the National Encounter Party (Partido Encuentro Nacional), the Solidarity Country Party (Partido País Solidario), the Broad Front Party (Partido Frente Amplio) [all centre-left], as well as the Tekojoja Popular Movement (Movimiento Popular Tekojoja) and the Party of the Movement toward Socialism (Partido del Movimiento al Socialismo) [both with a clear socialist orientation]. But the unity behind the presidential ticket didn’t translate into an alliance at a parliamentary level, which reduced the possibility of these forces reaching parliament. The parliamentary results were bad for the left, which obtained a very small number of seats. The right wing parties were the big winners in parliament, especially the right-wing opposition. Together they obtained a comfortable majority. On April 10, 2008 Paraguay elected a government with a clear progressive orientation but a parliament with a clear conservative orientation. On August 15, 2008, the Fernando Lugo assumed the presidency of one of the poorest and most unjust countries in Latin America. According to official statistics, 35.6% of the population lives under the poverty line and the percentage living in extreme poverty is 20% of the population . Wealth distribution also presents alarming figures: while the poorest 40% of the population receives 11.5% of the total wealth produced in the country, the richest 10% accumulates 40.9% of the total wealth . The country’s tax policy favours this unequal distribution of wealth, with the lowest tax burden in the region . No less serious are the failures in basic services like health and education, as well as the reduced scope of public works in infrastructure and communication. Throughout the last decades, the country has suffered from a large expansion of agroindustry, which has had a strong impact on the peasant economy, with the destruction of small peasant estates and the displacement of important portions of the rural population to urban centres, where they can’t find any possibilities of inserting themselves in the urban economic structures. Paraguayan society has not only been affected by internal migration, but also by external migration, especially to Europe and North America. Emigration has always been an escape valve for the Paraguayan economy, which can’t provide sufficient jobs. In the last decades this migration tended to be to Argentina and other neighbouring countries, but in recent years transcontinental migration had started to take place, affecting the more specialised middle class and with increased social costs. Lugo’s first year of government: advances and challenges. Despite this harsh inheritance and the particular limitations, one can point to some advances after a year of Lugo’s government. Principally in the sphere of health, the struggle for national sovereignty and in assistance to the impoverished sectors. Lugo has managed to place on the political agenda historically contentious issues like agrarian reform, in a country with profound inequalities in this sphere . With the aim of drawing up and implementing plans in this regard, an inter-institutional organisation was set up with the participation of all the peasant organisations . The struggle for national sovereignty has also made important advances, especially in regard to Paraguay’s rights to the electrical energy produced in both bi-national dams. Paraguay is one of the major producers of electrical energy in the world thanks to two dams constructed in co-operation with its bigger neighbouring countries, Brazil and Argentina. But throughout the last decades previous Paraguay governments have submissively accepted disadvantageous conditions imposed by the neighbours. The Itaipu dam, constructed in conjunction with Brazil, sends almost 95% of its electrical output to the Brazilian market, paying the Paraguayan state cost price. This agreement is backed by the unjust treaty that gave birth to the dam (1973), signed at a time when both countries had harsh military dictatorships in power. The Yacyretá dam, constructed in conjunction with Argentina, also supplies a large part of its electricity production to Argentina. In both cases the new government has promoted dialogue with its counterparts. But the conversations have acquired greater significance in the case of Itaipu, since the Paraguay’s demands relating to the dam have generated opposition from the authorities of Brazil . With the aim of advancing its demands, the Paraguayan government has urged the Brazilian government to form a negotiating commission around the demands defended by Paraguay. Finally, actions have been carried out to assist extremely vulnerable sections of the population, although undertaken in a very limited way. Through emergency plans, impoverished peasants and indigenous communities have received food and medical assistance. The triumph of Lugo and the APC constitutes an important milestone in the political history of Paraguay. This was the first change of presidential command from one party to another via a peaceful and democratic route in the history of the country. All previous changes had been by force of arms. This peaceful alternation in power constitutes a great achievement of the current president. But the simple alternation of power does not entail in and of itself a definitive break with the legacy of the past. For this, policies of profound change are necessary, policies that achieve a significant and immediate effect in particular for the historically marginalised sectors, as well as the population in general. In comparison, we can see that such policies of change have not yet been clearly seen. From the appointment of his cabinet, this new government began demonstrating clear signs of conservatism, with a strong presence of actors linked to the PLRA and right-wing positions. With respect to security, a traditional banner of reactionary sectors, changes continue to be postponed. In its statements and in its actions, the department of the interior has prioritised a repressive policy rather than a preventative one, managing to even fall into the practise of criminalising social struggles as previous governments did. Since the inauguration of the Lugo government, there have been repeated cases of repression against the popular movements: from peasant organisations involved in land occupations and roadblocks, through to trade unions and indigenous organisations, including even human rights activists . In terms of social policies, the advance isn’t very significant either, even when there aren’t steps backwards in comparison to previous governments. The agrarian reform, one of the principal banners of the electoral campaign of the ex-bishop, hasn’t moved forward with any concrete steps. This is due, in large part, to the influence of conservatives inside the government, as well as the associations of big rural producers and landowners. In respect to subsidies, there are also shortcomings. For small electricity consumers, the current government has taken a step backwards in relation to its predecessors. The so-called social rate for electrical energy, which provides a subsidy to small consumers of electrical energy, was previously assigned automatically. A new decree has limited access to this subsidy, excluding a range of beneficiaries, as well as establishing new bureaucratic measures and conditions in order to gain access this benefit . Moreover, the lack of firmness in confronting the economically powerful in the country has led the executive to back down on decisions already taken. This is the case with the decree that regulates the use of insecticides in agriculture (agrotoxins) and the fumigation of soya crops by planes. The decree, after being enacted, was suspended. This especially affects small peasant producers whose properties adjoin large soy plantations, and who suffer various sicknesses and health conditions due to the toxic insecticides dumped over their housing. In regards to the economy, the executive has maintained an extremely conservative line, at the request of the current minister of the treasury Dionisio Borda . The anti-crisis plan presented by the executive to reduce the impact of the world economic crisis is an example of this. The plan concentrates its effort on sectors like banking and agriculture, when these sectors have been increasing their income in an exponential way over recent years. Throughout 2008 Paraguay’s financial system gained enormous profit margins, converting itself into one of the most profitable in the world . Similarly, agricultural production such as soy and meat have achieved profit levels never before reached . Meanwhile, subsidies to social programs in continue to be limited and insufficient. Another unpopular measures undertaken by the executive was the rejection of improvements to the minimum wage. This measure, recommended by the minister of the treasury, contravened legal regulations that require the minimum wage should be adjusted once an inflation rate equal to or greater than 10% is registered. In December 2008, the Central Bank of Paraguay announced inflation as being at 10.3%. Although the left that supports President Lugo has insisted from the start of his government on the importance of promoting the creation of a National Constituent Assembly, as well as forming a political structure which could provide closer support, and with a popular base, Lugo continues opting for a conciliatory solution. The danger with this path is that it brings the president closer to the right-wing inside of the government alliance, at the same time as it distances him from the popular and left wing within the alliance. The left, frustrated by the slowness of the process of change, is constructing spaces for unified action. The result of these moves, if successful, could influence a firmer and more frontal positioning of the left in relation to the right wing inside and outside of the government. This could combine efforts both in the institutional sphere (from positions occupied inside of the government) and in favour of popular mobilisation. Paraguay is in the midst of a process laden with big contradictions and with still undefined tendencies. Is change underway? The process is reaching a moment of definition, arriving at a crossroads with two paths: the first, the path of breaking with the previous political order, implying confrontation with the principal power groups; the second, the path of inertia and continuity of the pre-established order. This is the great dilemma that confronts Paraguay today. Superficial change, of simple letterheads; or profound change, of structures and bases. The dilemma of whether or not to move beyond a country of injustice, inequality and exclusion. Nothing is defined as yet, but the limits for finding solutions are approaching. The next months will give the final sentence and in the end the word “change” will be defined by the force of events. 1) Liberal hegemony had a brief 18-month interruption, between 1936 and 1937, due to the establishment of a people’s assembly government installed by an armed uprising, headed by Colonel Rafael Franco, after the Chaco War against Bolivia (1932-1935). 2) Dirección General de Estadística, Encuestas y Censos. Encuesta Permanente de Hogares 2007. 4) According to data from CEPAL, Paraguay has a tax burden of scarcely 12.9%, compared to Argentina with 29.2%, Brazil with 35.6%, Uruguay with 24.1%, Bolivia with 20.1% and Chile with 21.3% (CEPAL, Economic Study of Latin America, 2007-2008, p. 356). 5) According to the Rural Network of Paraguay (Red Rural del Paraguay), formed by NGOs from the agriculture sector, “351 owners (physical or legal persons) possess 40.86% of total agricultural cultivation, with more than 10,000 hectares each. Likewise, 533 owners have 15.3% of the land, totalling 3,644,873 hectares, with properties of between 5000 and 10,000 hectares … This situation converts Paraguay into the country with the highest level of inequality regarding property distribution and land ownership in the world, well above Brazil, in accordance with this one can look at the Gini coefficient, according to the report of the Economic Commission for Latin America and the Caribbean (Comisión Económica para América Latina y el Caribe, CEPAL), year 2000” (http://www.redrural.org.py/V3/2009/el-poder-y-el-dinero/, downloaded June 2, 2009). 6) The Executive Network for Agrarian Reform (Coordinadora Ejecutiva para la Reforma Agraria, CEPRA). 7) 1.- Just Price. 2.- Free access to Paraguay’s energy surplus. 3.- Audit of the Itaipú debt. 4.- Administrational parity in institutions. 5.- Income from the finance offices of both countries in the entity. 6.- Completion of pending works. 8) Last May 1, the last minister of the interior of the Stroessner military dictatorship, Sabino Augusto Montanaro, returned to the country after living in exile in Honduras since 1989. Montanaro is responsible for the persecution, repression, torture and disappearance of hundreds of political activists who opposed one of the longest dictatorships in Latin America. Unlike other progressive governments in the region, like Argentina and Uruguay, that gave a major impetus to the search for justice regarding political crimes that occurred during military dictatorships, Paraguayan authorities suppressed demonstrators who demanded justice in front of the hospital in which ex-minister of interior was interned. For more information (in Spanish), go to: http://www.ultimahora.com/notas/218049-violenta-represi%C3%B3n-y-recuerdos-dolorosos-se-dan-en-protesta and http://www.abc.com.py/2009-05-02/articulos/517674/represion-a-manifestantes. 9) For more information (in Spanish), go to: http://www.lanacion.com.py/noticias-230729.htm. 10) Also a minister of the previous government in the 2003-2005 period. 11) “The Paraguayan banking system is the one that obtained the largest rate of profitability in the world, according to a comparative analysis of rate of profitability over capital and the reserves of the entities as a whole, carried out on the basis of data from various central banks, the International Monetary Fund and the Office of the Superintendent of Bank’s, up until last November… Such is the situation that in Paraguay profitability over capital and reserves gives a level of 45.16%; in Hungry, said level is 29.60%; in Switzerland, 24.40%; in Turkey, 23%; in Peru, 21.77%; in Brazil, 21.50%; in Mexico, 21.39% and in Chile19,35%” (http://www.abc.com.py/2009-01-06/articulos/484643/record-mundial-en-ganancias-logran-bancos-de-nuestro-pais, downloaded: June 2, 2009). For more information (in Spanish), go to: http://www.abc.com.py/2009-02-21/articulos/497781/bancos-siguen-con-fuerte-lucro. 12) According to reports by the Investment and Exports Network (Red de Inversiones y Exportaciones, REDIEX) “in the year 2008, Paraguayan exports reached US$ 4433.7 million, which constitutes an increase of 59.2%, the highest rate of growth seen since the year 1989 … soy and its derivatives together composed 57% of the total, followed by cow meat, with 13%” (Foreign Trade Monthly Bulletin – Balance Sheet 2008 at http://www.rediex.gov.py/images/Boletin-Comer-Ext-Balance-2008.pdf, downloaded June 4, 2009).